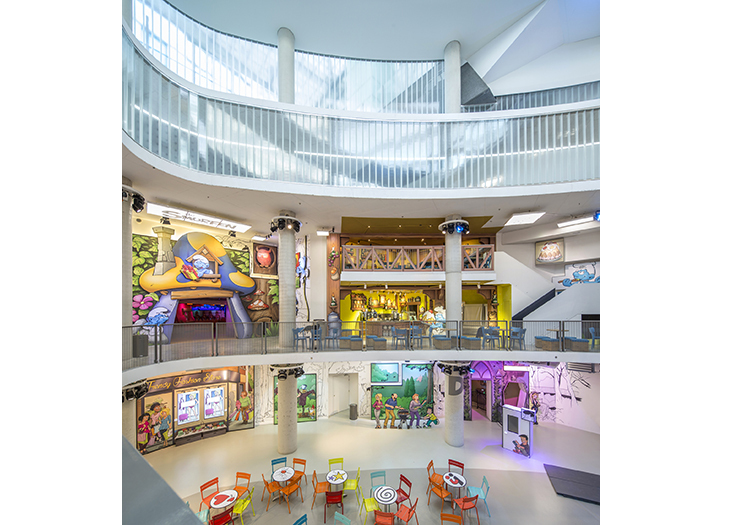 The Painting with Light team collaborated closely with Panasonic Belgium and AED on the AV elements and fully specified the lighting elements of the project, which involved nearly 1300 fixtures being used to illuminate over 60 attractions. These are spread across four stories and six zoned entertainment areas, each with a specific lighting focus and approach. When it came to choosing hardware, energy-consciousness, long term maintenance and reliability were high on the requirement list, but so were compact dimensions and the need for lights to be unobtrusive. 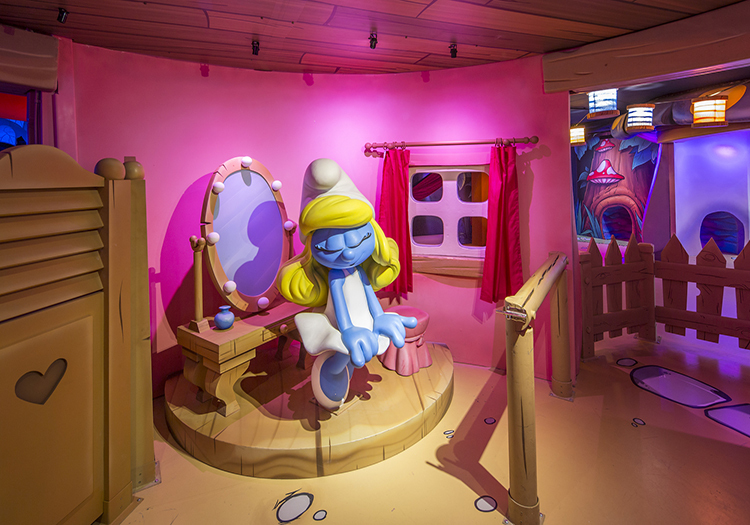 A selection of Gantom fixtures – from between 1 and 4 Watt LEDs in fixed colours to dynamic whites and RGBWs – are being used for highlighting the numerous attractions and different zones. Gantom is a manufacturer focused on making lighting products geared to the demands of the themed entertainment industry and currently has some of the smallest LED and other fixtures on the market. Painting with Light is also the exclusive Belgian distributor for this specialist brand, so the service and support package is an integral part of the lighting supply. Around 10 different types of Gantoms are rigged throughout Comics Station, including floods, spots, pin-spots, gobo-projectors and ellipsoidals. For the atrium space and some of the larger areas, bigger and more powerful fixtures were needed, so different Chauvet LED PARs were selected together with their Rogue R1 Spot and Wash LED moving heads plus Chauvet’s Maverick spot and wash moving lights, as well as a selection of Luxibel fixtures. 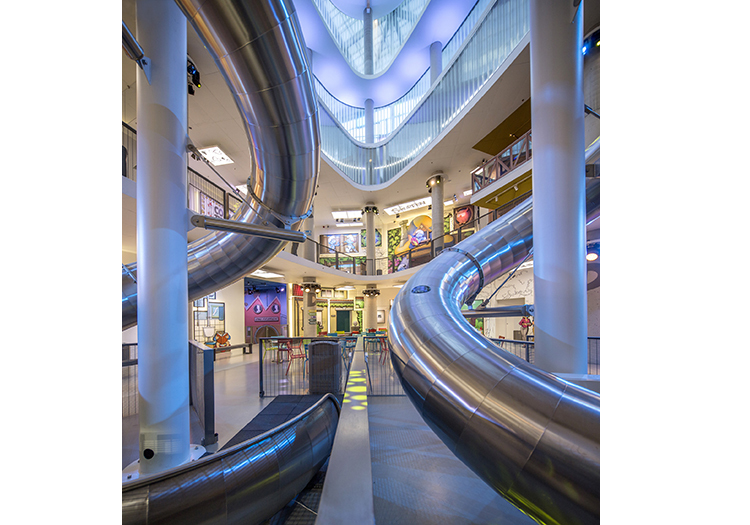 All the lighting is run via seven networked Pharos LPC1 controllers, which are linked to a wider building / attractions control system. Painting with Light also took on the role of projection consultants and system integrator, following Panasonic’s initial study of the building and specification of the hardware, which included 22 projectors and 86 LCD screens. This entailed fine-tuning the final positions, choosing the lenses and calculating alignment, beam angles, focuses, throw distances, etc. 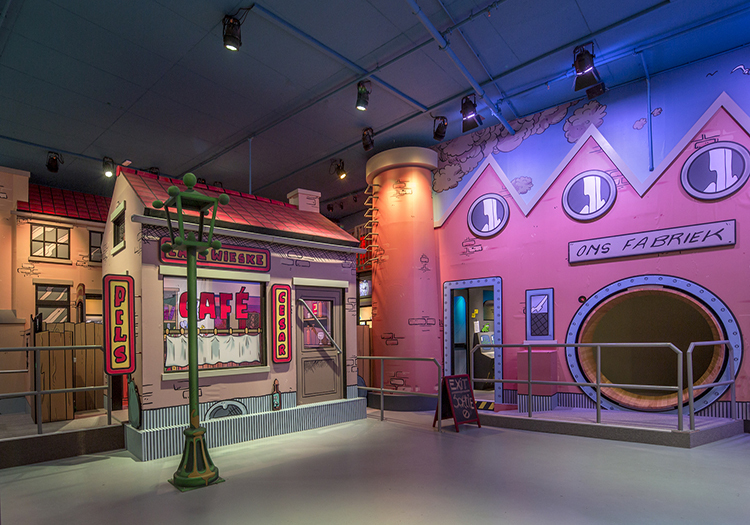 These projectors and screens were part of the rides, attractions and really helped bring to life the different zones. Their uses range from interactive projection in the dark ride to themed signs and information terminals. 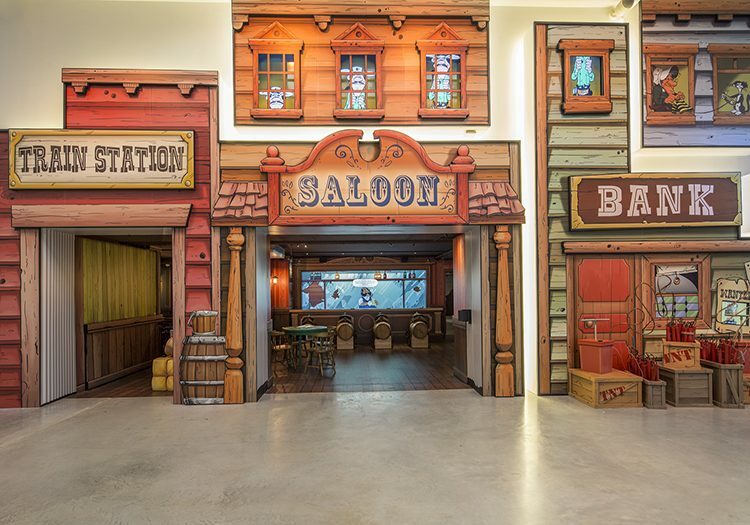 This is the first theme park worldwide to be located in a fully functioning international train station, offering a unique collection of art, ideas, fun and interactive experiences for all. Additionally, many of the attractions were in a part of the station that used to serve as an underground parking garage, meaning limited space and fixed architectural elements. 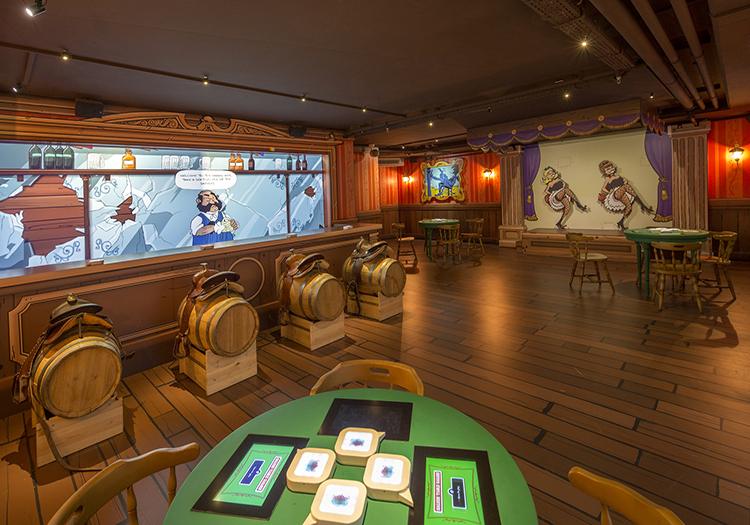 The many challenges of this project included finding exactly the right lighting ambience to highlight the zones and multiple interactive elements bringing the original drawn characters to life … engaging visitors on a journey of adventure. The busy, high-energy, almost trippy environment fuses the – sometimes thinly disguised – fantasy worlds with some pithy social, cultural and political observations and comments over the years, mixing cerebrally with humour and incisive wit. 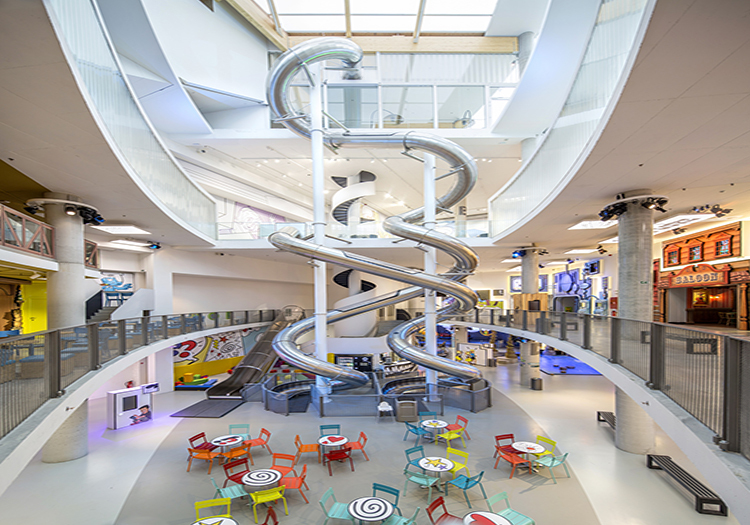 In physical terms, the 22.5 metres of headroom (which also features the world’s tallest indoor slide) in the centre and highest part of the space was a major consideration for lighting, as were the multiple projections … and the lighting around them. However, within the attraction, sometimes headroom was very limited, which called for unique lighting solutions. Another challenge was the rigging positions for lighting and projectors, which had to be chemically fixed into the walls and ceiling areas. Being a busy international railway station, the rules and regulations, health and safety requirements, etc. were super-tight, and the entire design process was meticulously planned, prepared and revised over two years. Then, once green-lighted … everything had to be delivered, installed, programmed and ready for opening in a timeframe of around 3 months! In developing an overall lighting concept to ensure the – already highly stylized – personalities of the comic characters stood out even more, the team drew on their multi-disciplinary experiences working on theatrical shows, attractions and pop performers – to create a totally unique lighting vibe for Comics Station. Cabling was another challenge – everything had to be neat, yet ultimately traceable and secured in the ceilings, where in most cases it is painted to blend in with the walls. 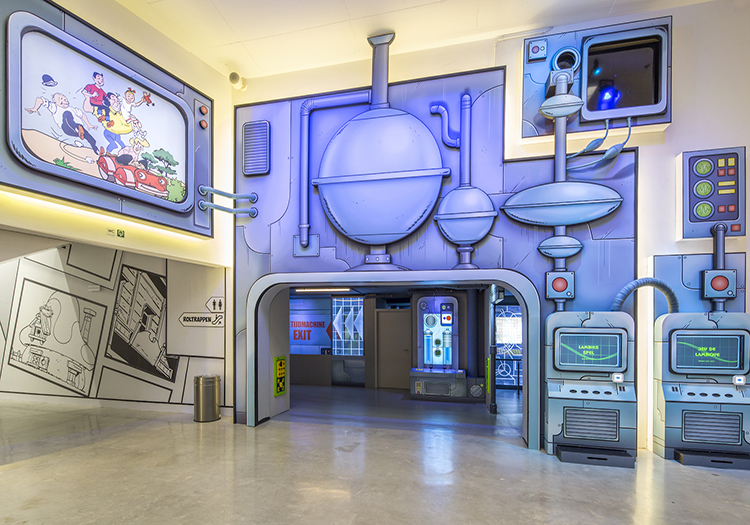 At the heart of the attraction are Belgium’s best loved comic heroes – characters like Suske en Wiske (Spike and Suzy), Jommeke, The Kiekeboes, the globally acclaimed multi-character Smurfs, bandit-chasing Lucky Luke and a celebrity flourish with Urbanus.